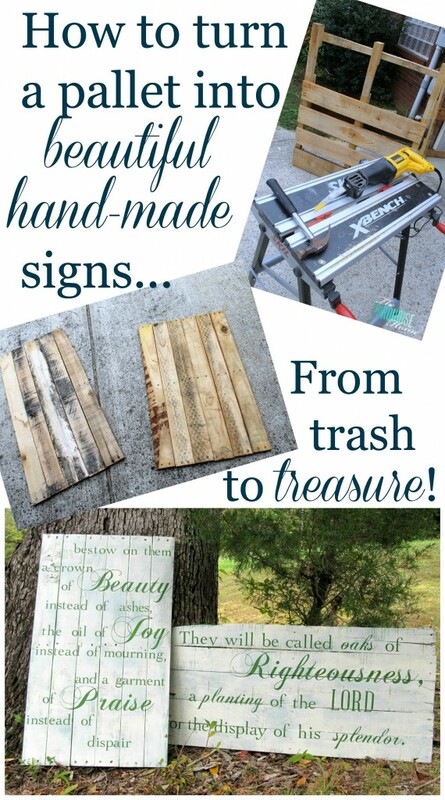 These DIY pallet signs make a beautiful gift that is sure to be loved for years to come! Or you can create one for yourself and enjoy the hand-crafted goodness in your own home. I know I’ve been promising to share the gift I made for my friends’ wedding last weekend, and didn’t want to make you wait any longer! My friend, Lara, asked me a couple of months before her wedding if I would make some signs with special Scriptures on them for her wedding. She also wanted to be able to hang them in her home. Isn’t that such a great idea? I love being able to use something for an event and then continue to enjoy it after the party is over. And the idea of giving a hand-made gift sounded perfect! This post contains affiliate links for your convenience. See my fill disclosure policy here. 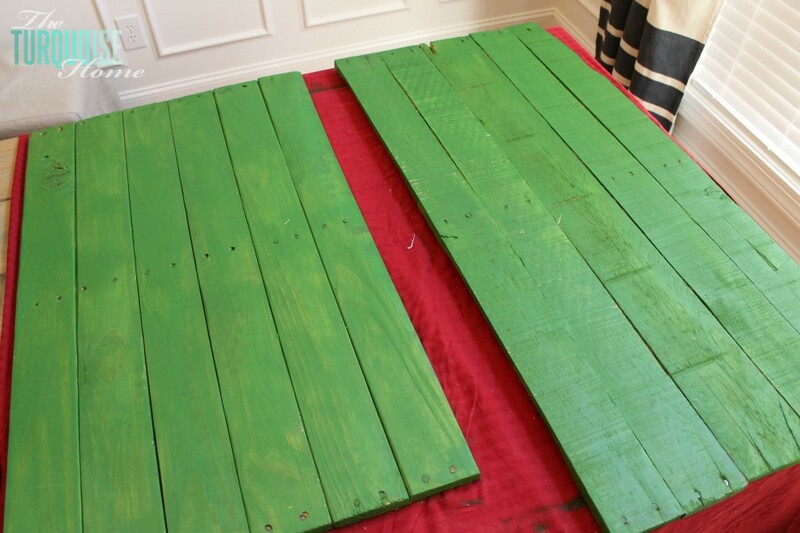 First, I removed my boards from my pallet. I use my DEWALT Reciprocating Saw with a demolition blade for cutting through wood and nails. A sharp, new blade will cut through the pallet joints very easily. Sometimes I knock the boards loose with a hammer first and then cut through them with the saw. 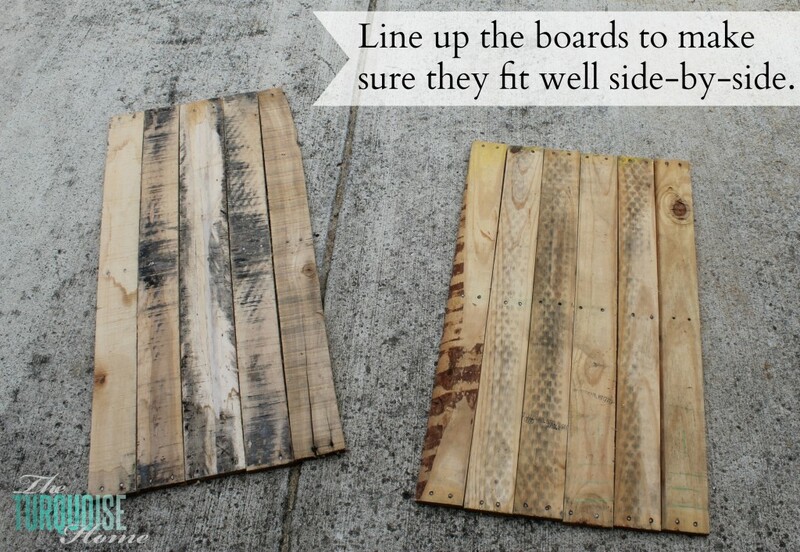 Once I cut off enough boards, I laid them side-by-side on the ground to make sure they fit well together. I had to rearrange them a few times to make them work. I used my Kreg Jig to attach my pallet planks to each other. 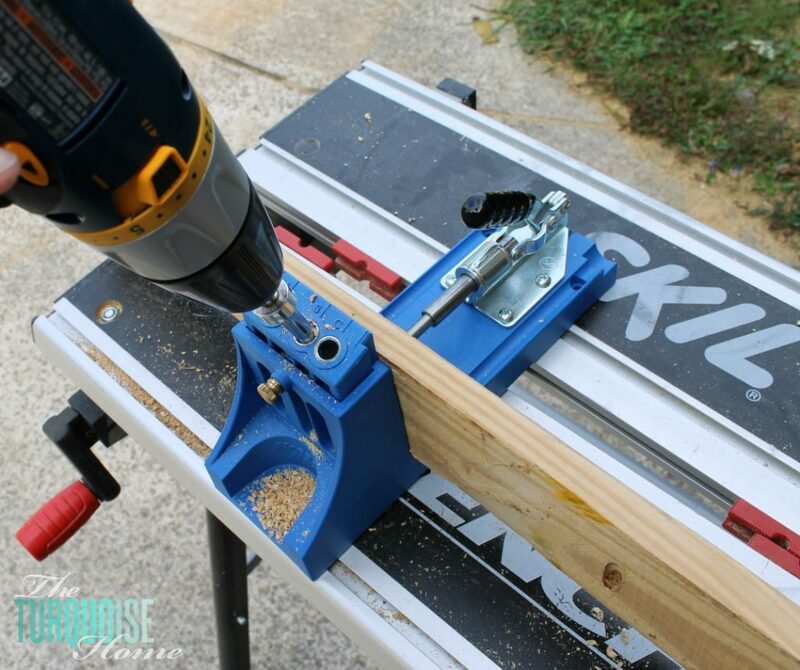 In my opinion, if you do any kind of wood-working projects, then a Kreg Jig is a must. It is my favorite tool in my garage. 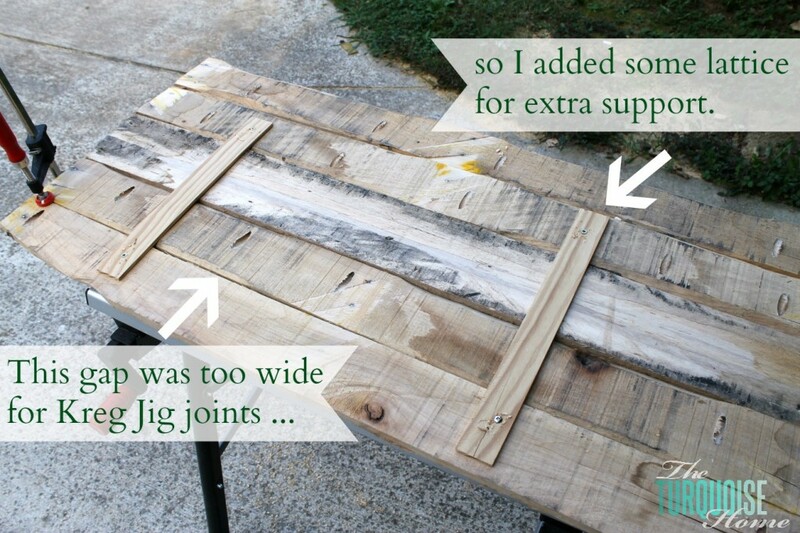 And it makes attaching wood side-by-side and creating joints a breeze! Once I got them all attached, I did have to attached a couple of reinforcements on the back of one sign. 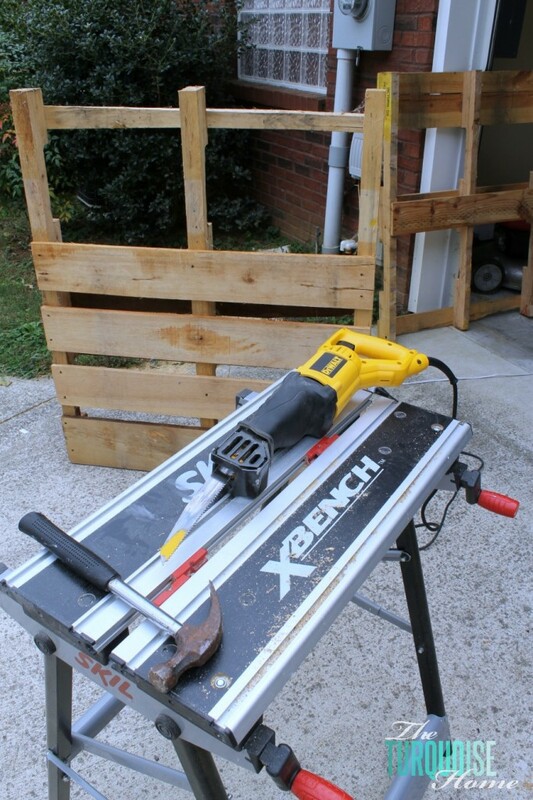 And if you don’t have a Kreg Jig, then you can use this method entirely. Just get a couple of scrap wood pieces that run the width of your sign and screw them into each board. I did this with my pallet sign on my mantel before I had my Kreg Jig. I wiped the sawdust off with a damp cloth and brought them inside. I painted them this beautiful green color that the bride picked out. It’s called Pantone Online Lime and I had them mix me up a sample pot of it at Lowe’s. 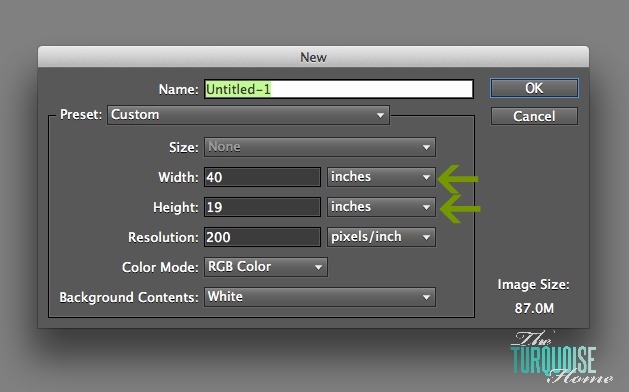 I started in Photoshop Elements, because I knew I could create a document using the same measurements at my board. That way all of my letters would be to scale. And then I just started designing my signs. I used these two fonts: Cochin and Chopin Script. 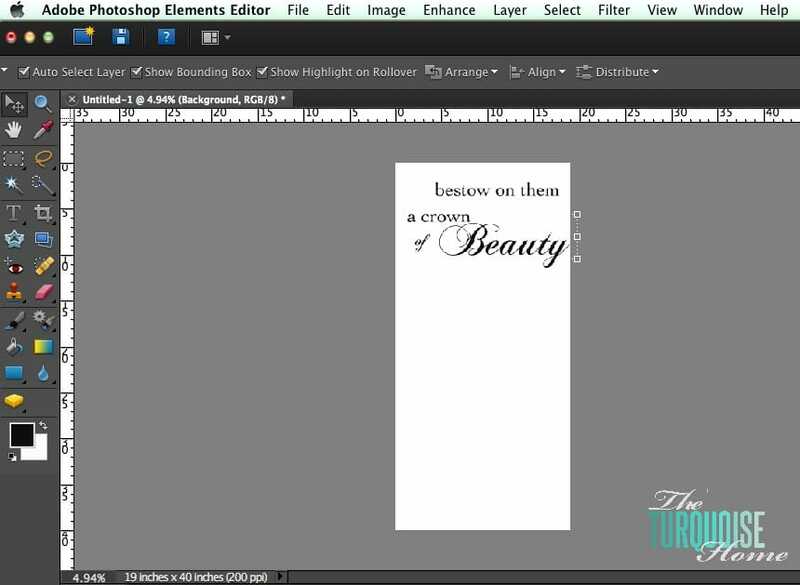 Once I had everything arranged just the way I wanted, I went into my Silhouette Studio software and used the same font size that I was using in Photoshop Elements and cut my words out of plain white contact paper. The last time I made a sign with my Silhouette, a kind reader alerted me to the fact that I could use contact paper or shelf liner for adhesive stencils. And it worked like a charm! I used this tutorial from Shanty to Chic for my Silhouette settings. And the only thing I changed was I set my blade to level 2 instead of level 1. That way it cut through the sticky layer of the contact paper and didn’t cut through the backing. I could then remove each letter one at a time and place it on the board. Once all of my letters were down, I used a trick I found from Sugar Bee Crafts.I painted around all of my letters with Mod Podge ! That way if there was any bleed underneath the stencils, then it would be clear Mod Podge and not white paint. How handy!! 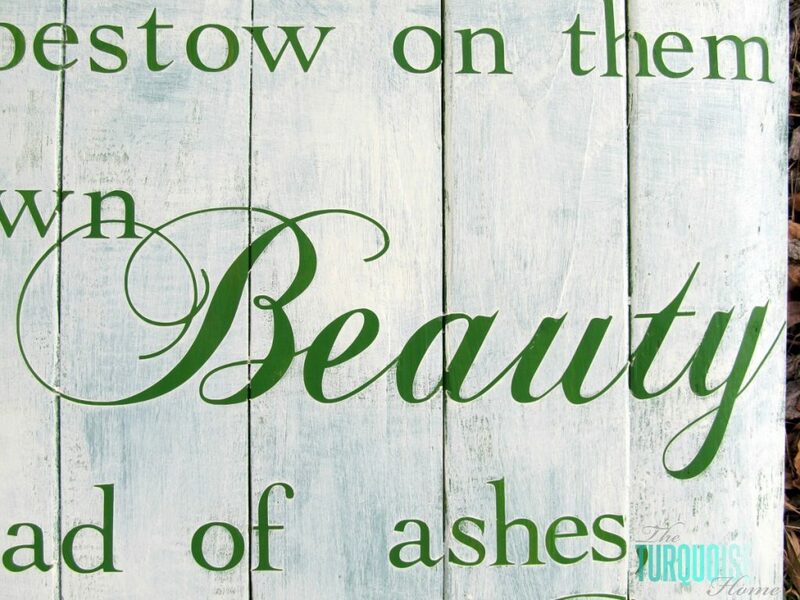 You can see in the picture below the white stuff around “Beauty,” “ashes” and “Joy.” That would be the secret ingredient doing its trick! I let the Mod Podge dry. Then I took some of my Sherwin Williams Antique White paint that I had on hand and kind of dry brushed it on in all different directions. I wanted it to be a thin coat and let the green come through in spots. After the white had dried most of the way, I peeled off the white contact paper to reveal the beautiful green beneath. I didn’t wait for it to dry completely because I probably forgot to mention that I was finishing these up at 2 am, the day I was leaving for the wedding. Um, yeah … I should have started on these a little sooner. I absolutely love – a million times over – how they turned out. I can’t to make some for my own house. 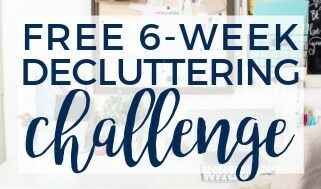 I’ve been wanting to make some for my master bedroom for years now … and I think now that I’ve tried it out on a friend, I can do it for myself. Ha! Just a little note: there was some bleeding underneath the stencils where the letters overlapped where two boards met, but I thought it looked fine. If you don’t want that to happen, then you probably don’t want to have letters overlapping two boards. I love how all of the thin scripty parts came out. Can you have a crush on “scripty parts?” I think you can. Swoon. Swoon. Swoon. Are you wondering what these looked like at the wedding? Well, I was too busy having fun that I completely forget to snap a pic. But one of the other bridesmaids happened to grab a one with her iPhone, so I’ll share what I’ve got. This was on the table as guests entered the wedding. I hope you’re inspired to make a sign of your own. 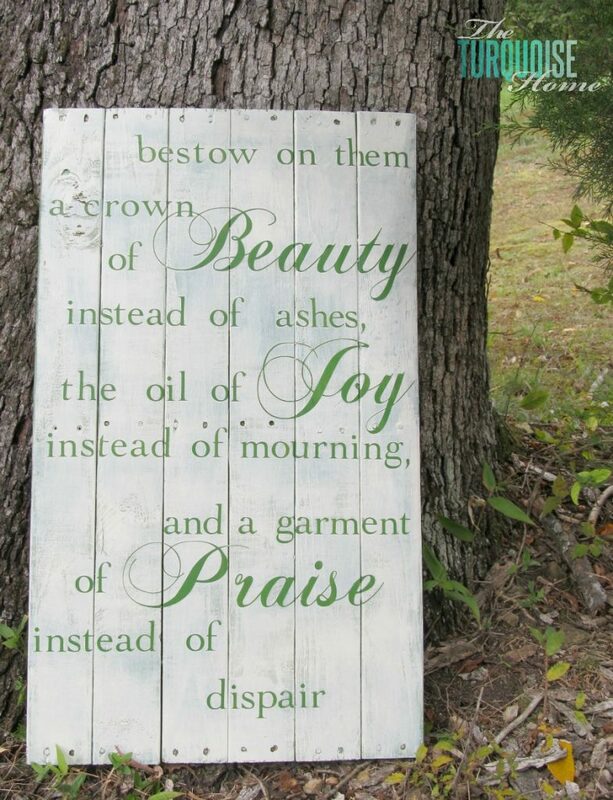 I just love how beautiful they are and can add such a personal touch to your home! Just wondering, do these not get damp & how far in advance could they be made? Would they need varnishing to be long lasting? What other software can I use beside Photoshop Elements to make my format for the stencil? I have the Silhouette Cameo already. Love love love did I say LOVE enough (lol) the pallet sign. It’s just beautiful. I think you can use the Cameo Designer studio software, too. I just didn’t have it at the point. Thanks so much, Diana! Lovely! I love the Mod Podge technique! Have you discovered transfer tape? 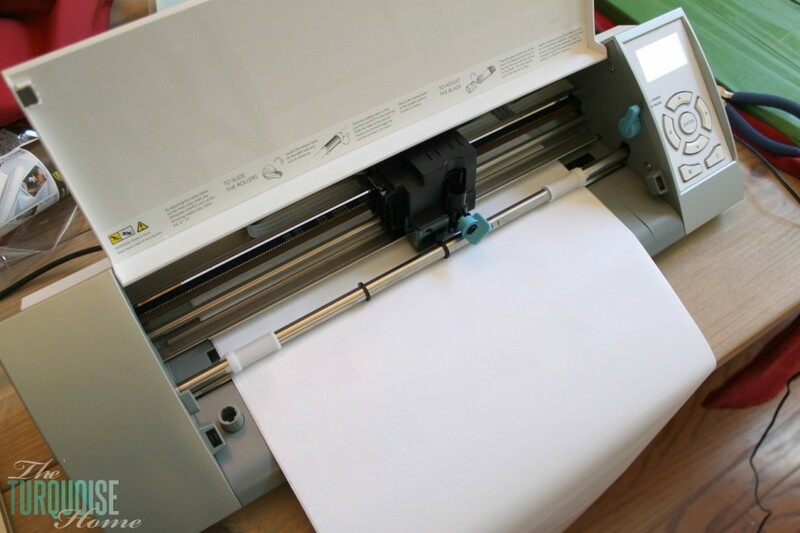 That makes moving your cut out letters from the backing paper to the board SO much easier! I use clear transfer tape – you can use it over and over. Best thing ever. You don’t have to move each letter that way. Hi there smart girl! I LOVE all of your tools! I love tools! Lol. 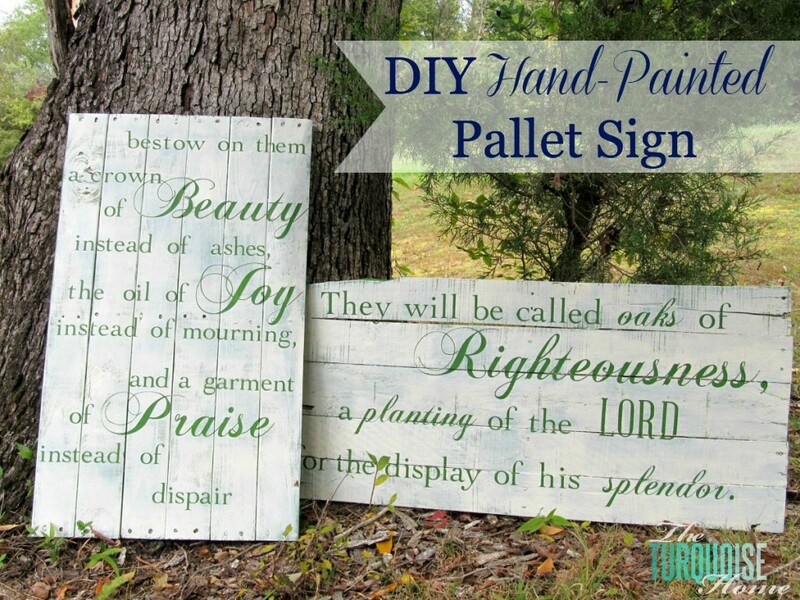 OK, I am dying to reuse my wooden pallet to make a sign. I keep seeing all these tutorials and everyone says to take scrap wood and screw it to the back. Well my question is: How come the screws don’t stick out of the wood on the front side? If you use tiny screws are they going to hold?? I don’t have a silouette or cricut machine. Do you know of a way to make letters w/o one? Don’t say Freehand!! I do not have a steady hand!! LOL Dawn. 🙂 I have used stencils from Michaels or Hobby Lobby before I had a Silhouette. They worked fine! And you just have to find the right length of screws that will go through both boards without poking through the front. I luckily have a plethora of random screws, so it’s not trouble. But you may just need to measure your board’s thickness and go to the store and buy just the right length. Good luck!! I love these signs, but they are not really for anyone on a strict budget. I was disappointed that they took equipment that most people don’t have and some of us can’t afford to go buy. I do love them though. Love the tutorial. Beautiful work. Please note “dispair” is spelled “despair”. Absolutely beautiful. What a wonderful way to use pallets! 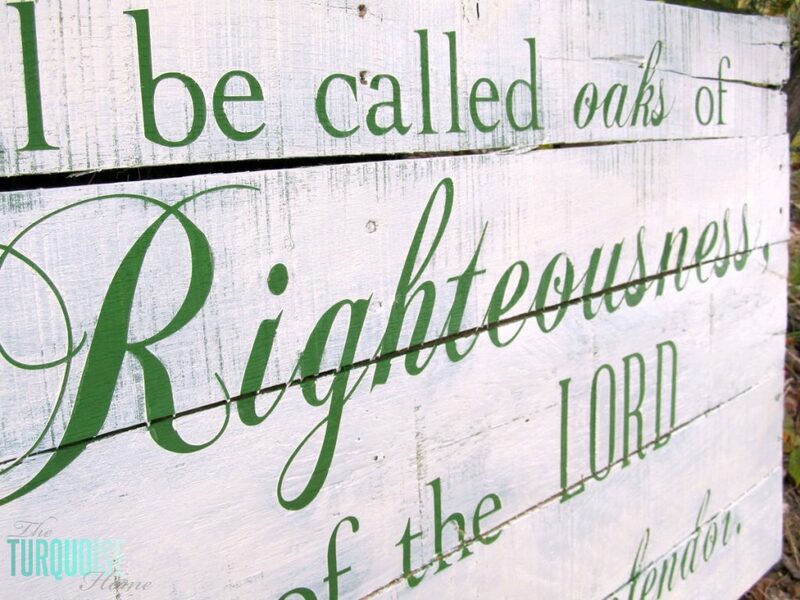 I especially like the “oaks of righteousness” sign. Thank you so much for sharing at Grace at Home. Those are gorgeous signs! I really need a Silhouette! Yes you do! It’s fabulous!! Gorgeous signs! Thanks for the tip on the mod podge. I will have to try that next time! Smart idea! 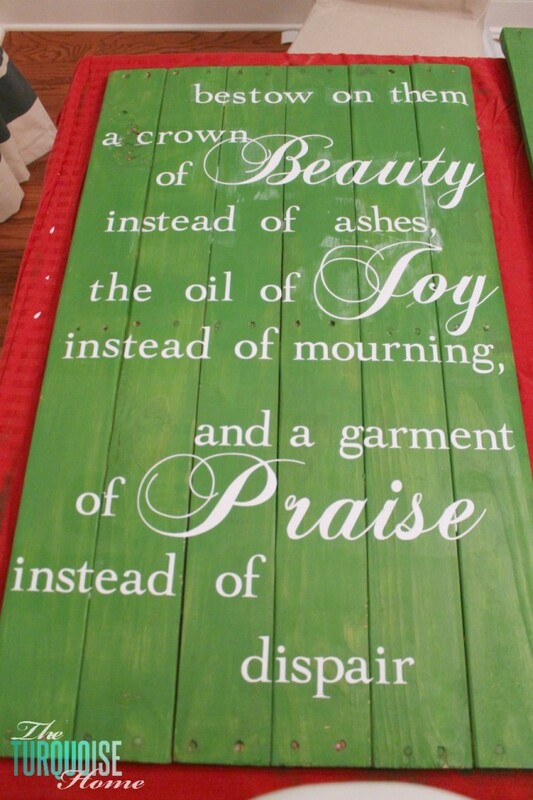 love pallets repurposed! Awesome Paint, On the beginning of your writing I never expect this will make a design like this. Please let me know can I use Photoshop except Photoshop Element ? Thanks for your great design. Either one would work fine! These are so beautiful! Would love to try it. Found you at Tasteful Tuesday Party! Pallets seem to be all the rage and I love how you have re used yours! Great signs! 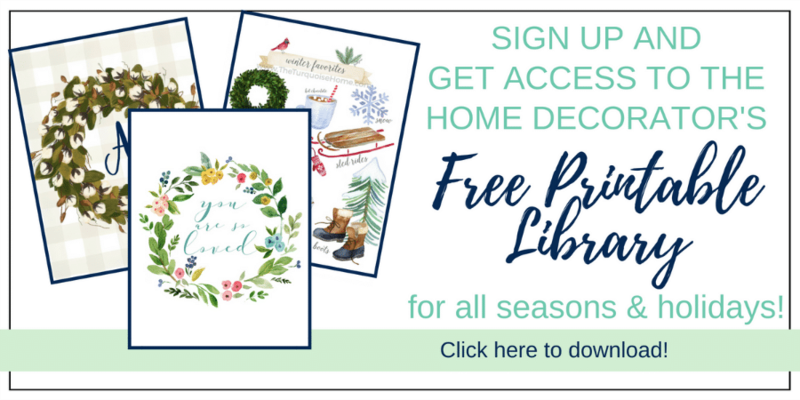 Be sure to stop by my blog and enter for a chance to win some handmade card I have been working on in my newly organized scrapbook room. its small, but does the job! Take care! Thank you Krista! I know a bunch of bloggers are giving away Silhouettes right now. Go enter them all and cross your fingers! 🙂 Or maybe you can get one for Christmas. It’s taken me a while to get used to using mine, but now I am using it for so many things. I really love it!! 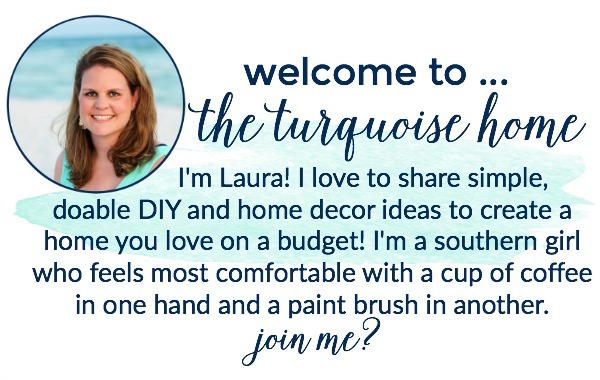 Gorgeous, Laura! 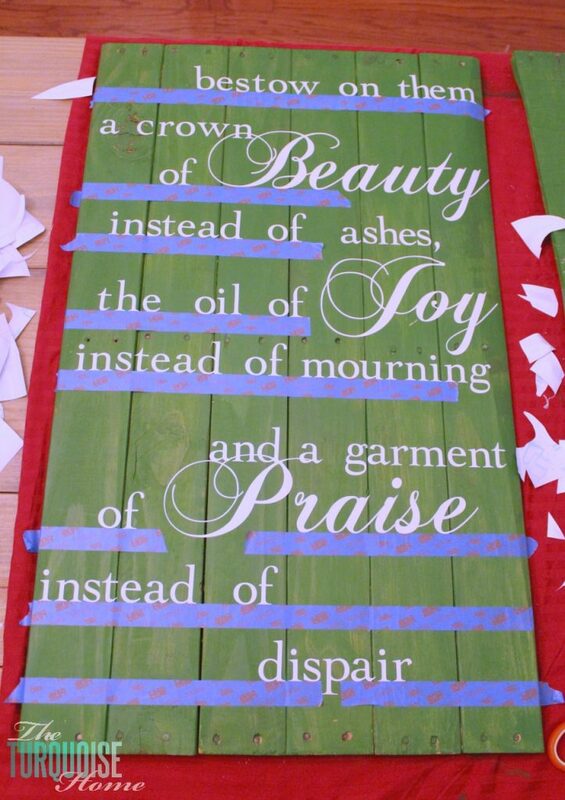 That scripture happens to be a favorite of my friend Gianna…I’ll have to share this with her. Also, MAJOR props for tackling that lettering with contact paper. I’ve used contact paper before as a transfer paper substitute, but never as a vinyl substitute. I know how tricky it is to work with. I’m so impressed with the outcome, though! I’m sure your friend was so touched by the gift these signs. 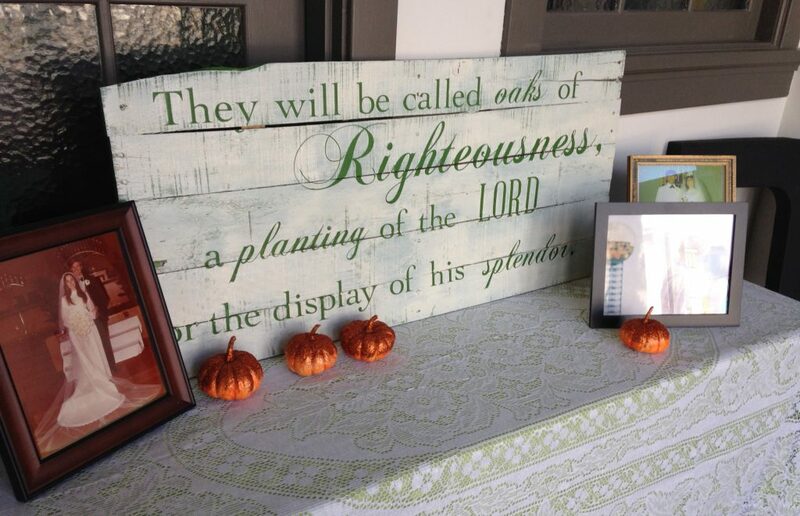 Not only are they great decor for the wedding, but now they can be displayed in their home and enjoyed for years to come! Brava! I think I need to get myself one of these! My house would be filled with pallet art and subway signs! These signs are gorgeous!!! You are motivating me to start on my pallet ‘flag’ soon! Thank you Tamy! I bet the pallet flag turned out awesome! !